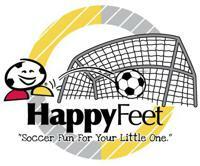 HappyFeet is an exciting soccer clinic for boys and girls ages 2 - 5. Using our proven, fun "Story Time with a Soccer Ball" approach, HappyFeet is committed to helping children form healthy exercise habits using the world's most popular game, soccer! The HappyFeet goal is that each and every child has fun, improves their fitness, increases their enjoyment of fitness activities, achieves a higher self concept, and gains advance skill! Your little one will enjoy a fun skills session followed by a transition into the game aspect of the sport giving him/her a great opportunity to focus on skill building and team work. Register now, and let your little one meet the HappyFeet soccer ball called “Bob the Bobcat!” We will move indoors to the Southview Gym in the event of inclement weather. Little Toes: Ages 2 & 3 act out nursery rhymes and songs. Big Toes: Ages 4 & 5 have a blast with stories and fun games. SV Elementary / Gym/Dining. Outdoors at Southview in the spring weather pending. *No cleats in the gym! Register By: One week prior to start date, classes may fill sooner than that so please register early!